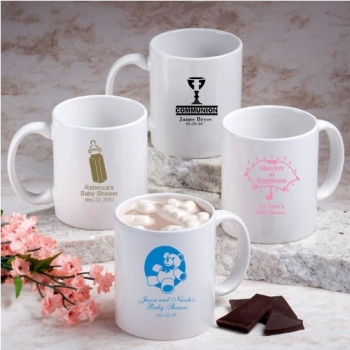 Percolate the senses with your choice of cute designs and your personalized message on these custom mugs. Each mug measures a standard 3 3/4 inches tall by 4 1/2 inches in diameter, with an 11 ounce capacity. Made of white ceramic and silk screened with your design on the side. We have a wide variety of options for all occasion themes, designs, colors, and titles that match your personal style. Click the More Images tab above to see a photo of the optional gift box. Minimum order is 30. Shipping is free. Please note: Screen printed mugs cannot be replaced if damaged in transit. A credit will be issued for any broken mugs.